Are you a fan of Halloween? It's not one of my favourite holidays but Chloe goes crazy for all things spooky, creepy and trick or treaty. Last year, Halloween fell on a Saturday so we decided at the last minute to have a party for Chloe and her friends on the Friday night. 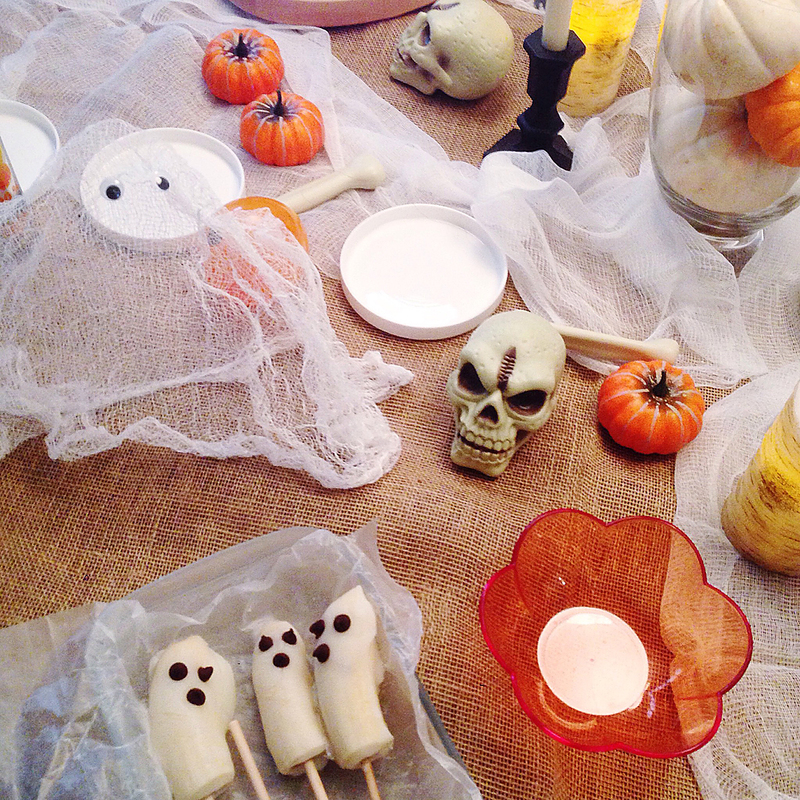 It turned out to be quite fun so I thought I would share some of our Halloween party ideas - even the ones that were a Pinterest fail ;) Sorry for the very poor quality of the photos! 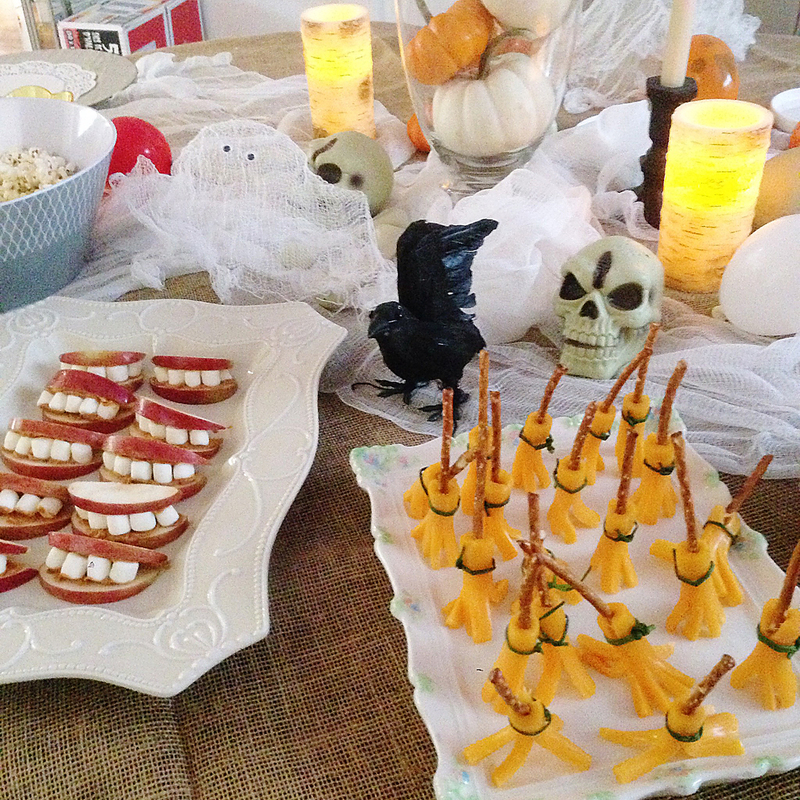 Our party decor was very simple - basically I threw all the Halloween decorations I had onto the dining room table! I covered the table with burlap and scattered the accessories. Faux pumpkins in vases, plastic skulls and bones, and flickering candles were just creepy enough to delight our 5 to 8 year old party-goers. 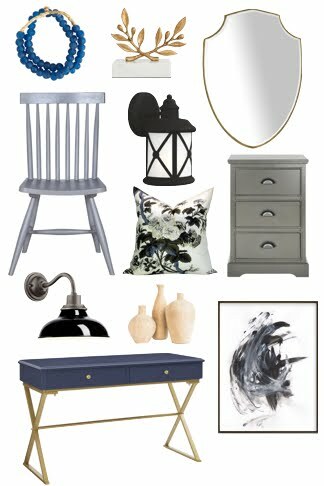 At the top left, you can see our one Hallloween craft, the floating cheesecloth ghost. It was somewhat successful but if I were to do it again, I'd use a taller form (I used a balloon in a small vase) to make the ghost taller instead of wider. The frozen banana ghost pops were easy to make and were a hit with the crowd. 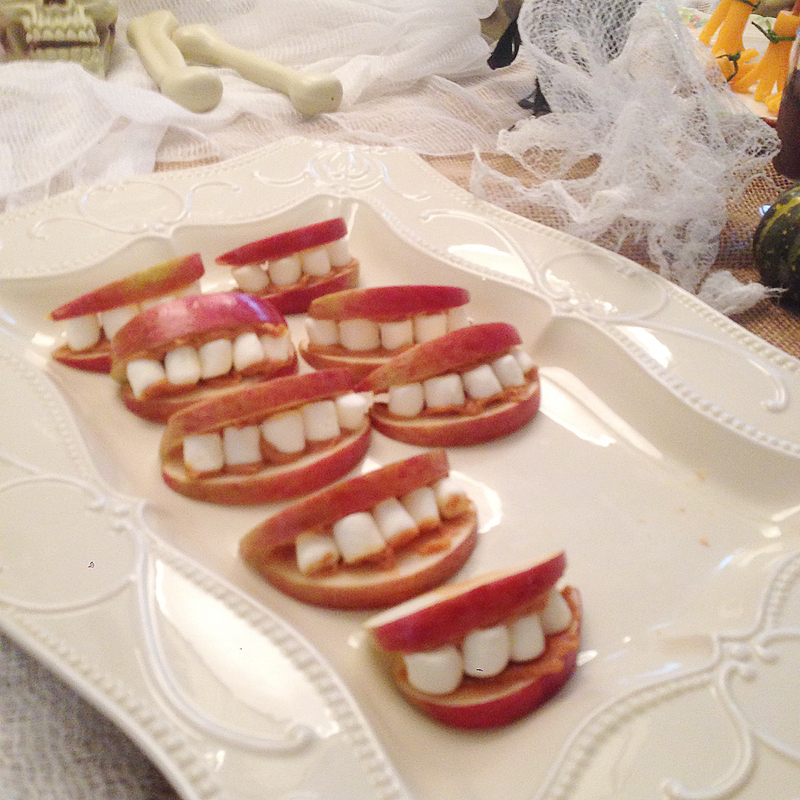 Another idea I found were these apple peanut butter teeth. They were easy to assemble and looked cute on a plate, but I'll be honest, the kids really weren't drawn to these. They were a bit cumbersome to eat and the marshmallow teeth kept popping out. I also made these cheese and pretzel broomsticks. Don't they look sad? The cheese sticks got both limp and dry after a while and wouldn't stand up. And who wants to eat limp and dry cheesesticks? Not any little ghosts or goblins I know. Especially when you tie chives around said cheese, because, eww, that's practically an onion. Pinterest fail. 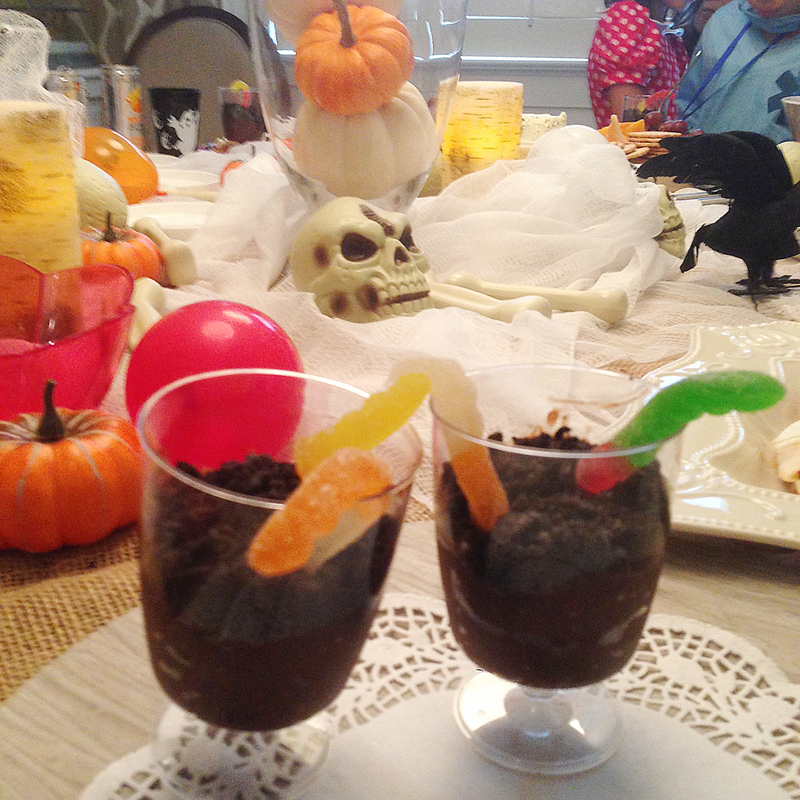 By far, the kids' favourites were the mud and worm cups. These were quick and easy and I enjoyed one myself. I'll definitely be making these again this Halloween. 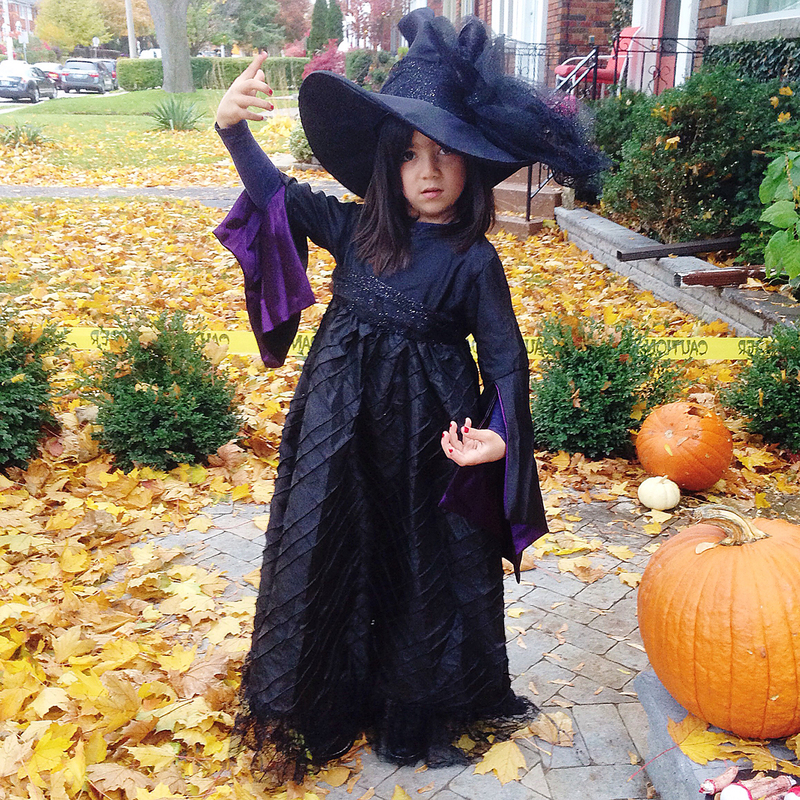 Here's Chloe in her store-bought witch costume from last year. It amazes me how much she has grown in just a year! She has been asking me to make her a Bride of Frankenstein costume this year. I've made her Little Red Riding Hood and Elsa and superhero capes in the past so it should be doable. Time to dust off the sewing machine. Maybe I'll sew up a matching Frankenstein costume for Sean too. I love seeing matching kid & parent costumes.